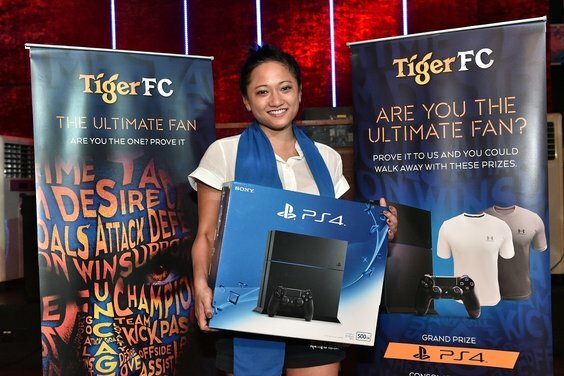 Tiger FC rewarded four fans with a Sony PlayStation 4 each at the start of its ‘Ultimate Fan’ search that kicked off last weekend. Kuala Lumpur, 28 Sept 2015 — Four Tiger FC fans proved they have what it takes to be strong contenders in the club’s search for ‘The Ultimate Fan’. In a showdown of footie whizzes on September 19 held at Laundry (The Curve), Souled Out (Bangsar South), Home and Away (Bangsar) and TBF (Penang), Ng Mei Ling, Dan Mitchell Pereira, Vincent Ng Chee Wai, and Rekkesh Sinnaya took home a Sony PlayStation 4 each. The four are now automatic finalists to a grand showdown happening in May 2016, where all 80 winners will compete for ‘Tiger FC The Ultimate Fan’ title. The ultimate prize? A trip to Europe for two to THE football match of 2016. So if you think you have the chops to take on the others and get your hands on one of the remaining 76 video game consoles, visit selected Tiger FC clubhouses during predetermined matches throughout this 2015/16 football season. The mechanics are simple: participate in a football trivia, answer the questions correctly, get shortlisted and win the knockout round! There will also be Under Armour T-shirt consolation prizes to be won. “Like all previous engagements organised by Tiger FC, the search for ‘The Ultimate Fan’ is another avenue to reward the real fans. With a sturdy legion of fans with a strong passion for the sport, we believe they will appreciate this opportunity to test how well they know the ins and outs of football. Come join us at our clubhouses. It’s going to be an exciting season. Apart from bragging rights, there will be plenty of great prizes to be won,” said Tiger Beer Marketing Manager Jessie Chuah. Put your smarts to the test at the next event happening at 10pm on Oct 4 at Mayang Oasis FC (in SS2), Gridiron (Bangsar), Why Not Bar (Changkat), and Olive Kitchen + Bar (Penang). For more information and event listings, visit Tiger Beer’s Facebook page www.facebook.com/tigerbeermy today.